Provided the Packers make the playoffs, the lasting image of a season is almost always the final game. Either they win the Super Bowl and I’m flooded with memories of that game, or they lose and I think of all the things that went wrong in that loss. When I think back on the 2015 season, the lasting image is Larry Fitzgerald catching a ball with no one in sight and rumbling inside the 5 yard line. Sure, I’ll occasionally marvel at how amazing it was that we saw two Hail Mary’s in the same season (one in the playoffs), but that’s about as far as I’ll go. I wanted to change that this season. I wanted to take a look back at some of the great plays of the 2015 that will be easily forgotten in the wake of such a heartbreaking end. I keep saying how disappointing this season was, but there were a lot of good times as well. I wanted to look back on some of those, and also offer some other, non-football things that I loved about 2015. I figured I would start at Week 1 and work my way through chronologically. It makes the most sense to me to do it that way. I won’t break down the plays like I normally would, although I say more than few words about some of them. There were a couple of games I didn’t include here (I didn’t write up one game, and there was at least one other without a truly memorable play), but, for the most part, every game is represented. And now, for the last time of the 2015 season, let’s get to the film. This is why I wanted to do a post like this. There are so many great plays I totally forgot about. This one game in Week 1 in Chicago. I have watched this play dozens of times and it never gets old. It’s a ridiculously accurate pitch from Aaron Rodgers and a great catch by Eddie Lacy. Here’s Aaron Rodgers juking a man out of boots, just because he can. “It’s late in a Jay Cutler game. An interception is coming any time now, right?” Sure enough, Cutler stared down his receiver and Clay Matthews read it all the way. I remember the announcers praising Cutler for his play in this game. “He looks a lot better this season. Much more in control. He is really playing within the offense.” Cutler finished this game 18/36 (50%), 225 yards, 1 TD and 1 INT for a QB Rating of 67.5. It’s not hard to clear a low bar, I guess. Since this throw came in Week 2 (and since Rodgers completed 2 Hail Mary’s this season), it’s easy to gloss over just how ridiculous this throw was. Fading to his left, Rodgers throws a dart 30 yards on a line and splits two defenders – one of them being Richard Sherman – for a touchdown to James Jones. I can’t get over how perfect this throw is. Watch Jayrone Elliott  off the left side. He rushes the pass, sees the screen, drops back and makes a one-handed interception. While Elliott is reading this perfectly, Mike Pennel  is closing on Russell Wilson. I was really excited to see both of these guys this season and they did not disappoint. Damarious Randall is at the bottom of the screen,. He sits in zone, recognizes the receiver coming out of the flat, drives on him and makes a perfect hit. I loved this hit so much I made it into a much shorter gif. I love Damarious Randall so much. Yet another Jayrone Elliott play. Coming hard off the edge, splitting two defenders and taking down Alex Smith. This is one of my favorite gifs of the year, showing the most excited Ted Thompson ever gets. Before the season, I predicted that Nick Perry would lead the Packers in sacks. I was very wrong on that prediction, but he had a pretty good season and a very good postseason. This was my favorite sack of his this year, using his hands to create space, then simply running around Joe Staley to collect a sack. Quinten Rollins with a lovely pick six against the Rams. From week 10 through the end of the season, Rollins played in at least 60% of the defensive snaps every game. It’s hard to find a rookie cornerback who can contribute immediately, and the Packers found two in this draft. Clay Matthews did a lot of this over the course of the season. Simply walk up to the line, directly in the A gap. At the snap, run directly between the center and guard and get to the QB. The craziest thing about this is that he did it quite a bit, yet I can only recall one instance when an offensive line was able to throw him off. Matthews finished with 6.5 sacks, the second lowest number of his career (he had 6 sacks in 2011). He did disappear at times this season (his 0 tackles in weeks 15 and 16 stand out), but he dropped back into coverage more than ever this season. Plays like this show what a special player he still is, even if the numbers aren’t quite where we’re accustomed to seeing them. What is this? Players motioning into a tight, stacked receiver set? And it served to get the underneath receiver open? Witchcraft! On the right side of the formation, Richard Rodgers is the man at the line while Ty Montgomery is set behind him. Rodgers takes two defenders, leaving Montgomery wide open on a dig, with a clear path to the end zone. It’s a beautiful little route combo, and it’s something I didn’t find myself saying very often this season. This is the play that ended the Chargers game. I love this play so much. A great read and perfect break by Damarious Randall on the outside. Have I mentioned how much I like Randall? I might ask him to the big dance. There was not much to like about the Broncos game, but this play makes me chuckle. Those of you who know me (and even those of you who don’t) know how much I despise Peyton Manning. Seeing him carry out a play fake and get hit immediately by Clay Matthews was a moment of pure joy for me. The fact that Manning complained about it directly afterwards (and was not rewarded with a flag) makes it even better. Does it make me petty to revel in a play in a game where the Packers were embarrassed? Perhaps. But I really don’t care. Let me have my happiness, no matter how petty. Once again, Nick Perry had a nice year. This was a great read and an athletic play to elude the blocker and take down the speedy Corey Brown deep in the backfield. Aaron Ripkowski had 1 reception this season, going for 18 yards. This was that reception. A bootleg by Aaron Rodgers, a catch by Ripkowski, and a rumbling run that ended with him destroying a man. I can’t think of any other player who caught only one ball in a season that I was so excited about (mainly because Willie Quinnie and Taco Wallace never caught a ball). We talked about this play all season. I will be talking about this play for years. I mentioned at the top that the lasting image of the season is the last game. That can also be true at a game level. I remember the Packers making a comeback against the Panthers, but the only thing I really remember about that comeback is that it ultimately came up short. This play gave the Packers the ball at the Panthers 22 yard line, down 37-29 with 3:38 left in the game. This drive ultimately ended with an Aaron Rodgers interception on 4th down, but this play gave them a shot when it looked like the game was all but over. Another game, another big play by Damarious Randall. This is kind of a long clip, but it’s worth it. It’s James Jones’ season in a nutshell. He starts the play on the bottom. He kind of runs a zig-zag pattern down the field (as if he’s trying to elude an alligator), turns the defender around a bit, then just kind of magically gets open. His defender ignores him for reasons unclear to me. Still, he gets open, and Aaron Rodgers uncorks a laser to the edge of the end zone, where Jones makes a great catch on the sideline. Apparently I’m a fan of Aaron Rodgers flip plays. This was a two point conversion to James Jones. Escape the pocket, draw a defender in, get the angle and pitch the ball at the perfect moment to find an open receiver. This play should not work, but it does, due in no small part to Rodgers making a play outside the pocket and Jones reading it. James Jones didn’t have a great year, but he still ended up with 890 yards (1st on the team) on 50 receptions and 8 touchdowns (1st on the team). His catch rate of 50.5% was brutal and he could look frustratingly slow at times, but I’m happy the Packers brought him back this season. I doubt he’ll be back next season, but I liked seeing him back with the Packers for one more season. Mike Daniels getting past his man and making a play in the backfield. I have about a dozen of these plays I wrote about throughout the course of the season. There’s nothing that really separates this one from any of the others, but I wanted to make sure I shone a little light on Daniels after the season he had. He earned every bit of that extension. When I talk about the 2015 season, I love that I have to specify which Hail Mary I’m referring to. I’ve watched this play dozens (hundreds?) of times, and it never gets any less amazing. This was one of my favorite offensive plays of the season. Not the outcome, but the play itself. On the left side, there is a dual-curl fly route combo (Randall Cobb and James Jones on the curls, Richard Rodgers on the fly for some reason). On the right side, there is a screen pass. Aaron Rodgers has to get the ball out fast (so there is not an ineligible man downfield penalty), but the Packers have essentially split the line in half and are running different plays to each side. It’s basically a packaged play, but both options are passes. It forces the defense to defend against both plays, which is next to impossible. I am madly in love with this play. I didn’t want to show this entire play, but I couldn’t write this post without watching Mike Pennel (to the right of Carson Palmer) throwing a grown man. It never gets old. Never. This Micah Hyde interception is insane. With one arm, he backhands the ball and tucks it. (I would again like to point out the celebration by Casey Hayward, who can’t believe what he just saw.) Just a crazy play. I would like to thank the spirit of Aaron Brooks and/or Jake Plummer who clearly inhabited the body of Teddy Bridgewater on this throw. I know it seems odd to have the only play from a playoff victory be a two point conversion, but that’s where I am right now. I love this route by Jared Abbrederis (in the slot to the right of the line). A little headfake to the outside to get the defender moving in that direction then a quick cut back inside. It’s a nice, crisp route in a small space, and it’s a great read by Aaron Rodgers to see that move and get rid of the ball with pressure in his face. Hail Mary #2. Like the first, it never gets less amazing. The first Hail Mary was an insane throw (there’s a fan video that shows the ball coming within about 10 feet of hitting the roof), but this one seems more difficult. Yes, he had to elude a rush in Detroit, but he was able to throw cleanly. Here he has to elude the rush and throw the ball while fading back and a couple defenders closing. I have no idea how he was able to throw the ball this far under these circumstances. It’s unbelievable. And that, my friends, takes us to the end of the 2015 season. A disappointing season, but not one devoid of amazing moments. I hope this helped you to remember some of those moments and be able to look back on this season with slightly less disdain than you otherwise would have. This is where I normally put my Random Thoughts, but I don’t really have any leftover, as the bulk of this post was nothing but Random Thoughts. Instead, I thought I would end with some non-football things I loved in 2015. Please chime in with your own (or any football thoughts/memories from this season) in the comments. – I had my first child in June. She’s a handful, but she’s amazing. I’ve been explaining the intricacies of the game to her, so she will likely be taking over Eye in the Sky for me starting next year. On a trip to Portland, OR, I drove up to Mount Hood and saw The Timberline Lodge. That’s where they shot the exteriors for The Shining. I also got to stop by Mt. Hood Brewing Company on my way up, which was tremendous. One of the best grilled cheese sandwiches I’ve ever had. On another trip to Portland, I flew into Seattle and drove over to Snoqualmie/North Bend, WA. That’s where they shot portions of Twin Peaks. 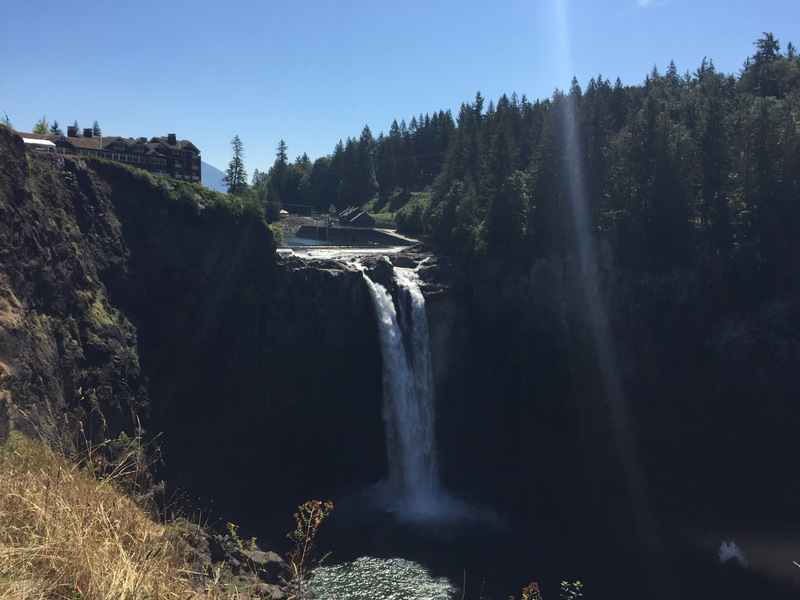 I got to see Snoqualmie Falls, and even ate lunch at the famed Double R Diner (although I am sad to report that they served only a perfectly adequate cup of coffee). I was able to leave a bit early on a trip up to Milwaukee and took a trip to Green Bay. Sadly it was not on a game day, but a trip up there is always great. I was able to see the new-and-improved Hall of Fame (the last time I was there was in 2007), spend entirely too much money at the Pro Shop, grab lunch at Kroll’s West, and just kind of kick around the city for a bit. While in Milwaukee, I stayed at a haunted hotel and went to Miller Park for a Brewers game. – Sitting a few rows behind the plate at Great American Ball Park and watching Miguel Cabrera hit a ball to Mars. In the gif below, look for the guy in the Tigers jersey raising his arm and jumping up as the ball leaves Cabrera’s bat. He is on the left side of the screen, a couple rows back. That man is me. – Watching the Warriors play basketball. It’s a beautiful thing to witness. It Follows. My favorite horror movie of the year. It has the feel of an 80s slasher (specifically Halloween, with its wide, lingering shots and Carpenter-esque soundtrack), with a twist. It’s such a simple premise, yet I still think about it on a regular basis. I ended up putting entirely too much thought into how best to escape The It. On top of a great premise, it also looks great and has a terrific cast. Mad Max: Fury Road. I saw this movie 3 times in the theater and another 2 times since it came out on Blu Ray. It was everything I wanted from a new Mad Max movie. It Follows was my favorite horror movie of the year, but this was my favorite movie. Pure, unbridled insanity. I love every second of it. Star Wars: The Force Awakens. As much as I tried to temper my expectations, I couldn’t help but get excited about this. I was not disappointed in the least. I didn’t walk out of the theater proclaiming it to be the best movie ever, but I did walk out of it grinning like an idiot, saying, “It just felt like it belonged with the original trilogy, ya know?” to random passerbys. They all understood. Ex Machina. Featuring one Oscar “Poe Dameron” Isaac as a creepy tech genius attempting to create sentient AI, and Domhnall “General Hux” Gleeson as the man tasked with trying to decide whether or not he succeeded. It’s a beautiful, creepy, claustrophobic sci-fi movie, and it includes one of my favorite (yet somewhat unnerving in context) scenes of the year. The Final Girls. Being a big fan of horror movies, I’m a fan of any movie that is able to show a well-worn concept in a new light (see again, It Follows). In The Final Girls, a group of college students are pulled into an 80s slasher film and they try to navigate through the film while staying alive. It has a great cast of very funny people. This movie is smart, funny and has a surprisingly strong emotional core. It’s kind of a more comedic, more polished version of Midnight Movie, with the film setting as a Friday the 13th knockoff (as opposed to the Texas Chainsaw Massacre knockoff in Midnight Movie). What We Do In The Shadows. A mockumentary about a house full of vampires, all coming from different eras. No real plot to speak of, but I laughed from beginning to end. This was one of the funnier movies I saw this year. Krampus. A different kind of Christmas movie. It’s a lot of fun, has a really dark sense of humor, terrific creature effects and a great soundtrack. This will be going into my regular Christmas rotation. Fargo. The first season was tremendous, and the second season was every bit as good. The cast is excellent. This show has a way of being really dark and extremely funny at the same time. They absolutely nailed the tone of the movie, which is really impressive. I can’t wait to see what they do next. Ash vs. Evil Dead. Like everyone else on the planet, I’m a huge fan of the Evil Dead I was wary of a TV show, but they knocked it out of the dark. Funny, frantic and filled with blood. Just what I wanted. It’s good to have Ash Williams back in my life. Hail to the King, baby. Luther. Luther returned for a 2 episode season late in the year, and I loved it. It looks like there may be a movie on the horizon, which is great news. John Luther may be my favorite Idris Elba role. Brilliant, troubled and always on the verge of doing something very dangerous. Elba crushes this role. Lord Huron – Strange Trails. The entire album sounds like it should be played on a slightly out-of-tune radio in an old saloon. My favorite track is “The World Ender”. It’s basically the tale of a man who returns from the grave to exact vengeance on the men that killed he and his family. It’s a tale of Western zombie revenge, and I love it dearly. Sufjan Stevens – Carrie & Lowell. I thought we lost this Sufjan to the siren’s call of experimentation, so getting this album was a lovely surprise. That’s not to say that I didn’t love The Age of Adz, but there’s something about the introspective Sufjan that really gets me. This doesn’t rank up with his best work, but it’s a solid album, particularly on a rainy day. The Wonder Years – No Closer to Heaven. The whole pop-punk/emo/screamo/whatever phase seems like a long time ago. The only ones left are those who do it really well. The Wonder Years definitely fit that description, and this album may be their best. “Cigarettes & Saints” – a song about a close friend dying of a drug overdose – is a particularly heartbreaking song that you can still crank in your car with the windows down. Margot & The Nuclear So and So’s – “There’s a Freakshow Downtown.” Margot released a boxed set of rarities spanning their career so far. This song – taken from the sessions for Buzzard – struck me immediately. I’m a big fan of quiet songs with violent lyrics, and they can pull that off better than just about anyone (Jesper Norda is also in that conversation). John Carpenter – Lost Themes. I mentioned Carpenter above. He’s been creating his own music for his movies throughout his career. This album is 9 themes he wrote without a movie in mind. So kick back with this synth-heavy collection of orphaned themes from the master of horror himself. If you’re feeling particularly froggy, put this on when you’re by yourself on a dark and stormy night, and follow it up with Disasterpeace’s It Follows. Godspeed You! Black Emperor – “Piss Crowns are Trebled.” The heaviest song I’ve heard this year. It takes it a minute to get rolling, but once it does it builds and builds until it hits a masterful crescendo. When I’m having a rough day at work, I’ll put this in my headphones and crank it as loud as I can. Dawes – “All Your Favorite Bands.” A beautiful song about good friends lost along the way. Sarah MacDougall – Grand Canyon. Swedish/Canadian singer/songwriter. This album is full of beautiful, hummable songs. I’m partial to “Baby, It’s Only Rock ‘n’ Roll”, but the lovely, Sigur Ros-esque “Malmo i mitt hjarta” is a close second. Father John Misty – I Love You, Honeybear. Carrying the soul of the late, great Harry Nilsson with him, Father John Misty really stepped it up with this, his second album. It’s most definitely NSFW, but it’s a lot of fun. Night Terrors of 1927, featuring Tegan and Sara – “When You Were Mine.” It’s the most danceable song about love and loss that I’ve heard this year. Pack to the Future. Most of you know that me, Brian Fonfara and Jordan Peck started up a Packers podcast this season. I’ve had a blast doing it and am really looking forward to keeping it going. We’ll be recording throughout the offseason, although not weekly. Trill Withers Podcast. The guy who runs this is a friend of mine from when I was at UK. He’s been doing this for a year and he keeps getting better. He covers a little bit of everything. He recently started up a website, and that’s worth a visit at least once a day. Lore. I just discovered this podcast recently, and I’m madly in love with it. Aaron Mahnke digs into the history of myths, legends and folklore. The episodes are around 30 minutes, and the creepy soundtrack that plays throughout really helps set an eerie tone. Bloody Good Horror. My favorite horror podcast. Once a week, they release an episode, usually about new theatrical releases. They’re funny and extremely knowledgeable. I’ve been listening to them for years. War Machine vs. Horse. Started by a couple of guys based in Lexington, KY. I love the concept. They take a look at a new movie, as well as an older movie or two that are either related to that one or share common themes. Basically, a new film and its distant relatives. They know what they’re talking about, and they have a great sense of humor. 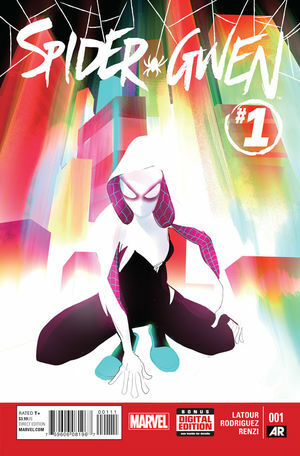 Spider-Gwen. The concept is perfectly fine: in one iteration of Earth (Earth-65, to be exact), Gwen Stacy was bitten by a radioactive spider instead of Peter Parker. Like I said, the concept is fine but the way it’s done is great. I love the writing, and I’m particularly in love with the design of her outfit. You can find a hoodie for sale, and I would have bought one by now if I thought I could pull off the look. Sweet Tooth. This is an older comic (it ran from 2009-2013), but I finally got around to reading it (after my older brother wouldn’t shut up about it for a year or so). It takes place in a post-apocalyptic setting, where most of the adults have been killed by a mysterious plague, and all the children were born as human/animal hybrids. We follow Gus, a young boy with deer antlers, living in a secluded cabin with his father. When his father dies, Gus ventures out on his own and is captured. From there, we see him and a group of humans and hybrids escape and try to survive, while also trying to figure out how the plague started. It’s a unique story. It’s incredibly well-written, has great characters and features some pretty cool artwork. There are also a handful of moments that absolutely broke my heart. I loved it. A couple more things, then I’m done. I promise. I’d like to thank Titletown Sound Off for giving me a place to post these things. Everyone at the site has been great, and I could not be happier to be a part of this. Big things are happening, and I think even bigger things are on the horizon. A special thanks to the great (and very funny) James Korsmo for editing pretty much every one of these posts this season. I’m sorry I’m so wordy. Last – but certainly not least – a HUGE thank you to all of you for continuing to read. 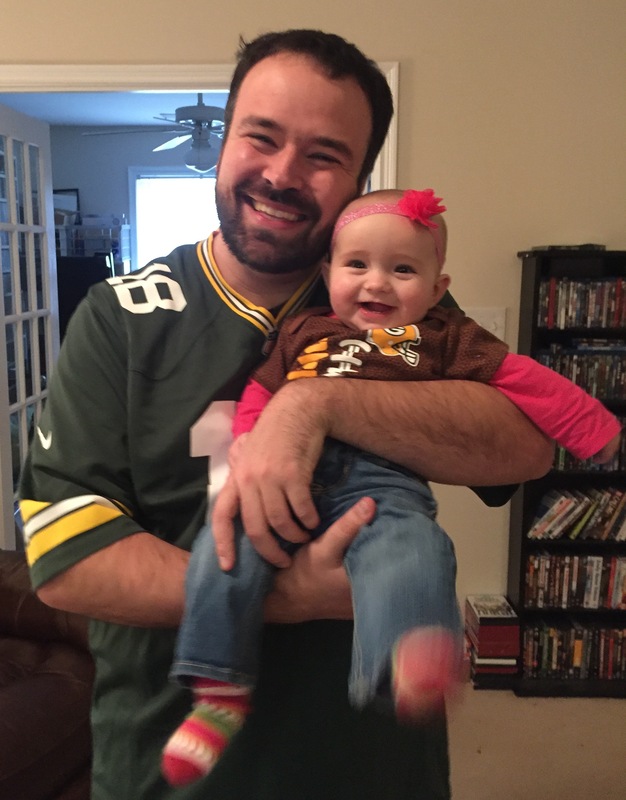 I’ve now been writing about the Packers for 3 years, and some of you have been reading me the entire time. Your words of support have meant the world to me. There have been weeks I haven’t felt like doing it, but knowing people are out there reading these makes it worth it. I love every interaction I have with you all. I hope at least a couple of you read through all the muck to get to this point in the article. You all are the best. If we’re ever in the same city at the same time, hit me up and we’ll grab a drink.